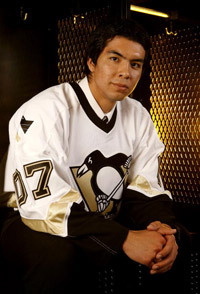 COLUMBUS, Ohio – Adding depth was one of the Pittsburgh Penguins’ goals at the NHL Entry Draft. They believe they achieved it Saturday as the two-day event concluded at Nationwide Arena. The Penguins selected three centers, three defensemen and a winger in Rounds 2-7. The moves complement the selection of Angelo Esposito in Friday night’s first round. However, there were no surprises for Pittsburgh like Friday’s selection of Esposito at 20th overall. He was the top-rated prospect for many months before slipping in the rankings later in the season. “I think the scouting staff did a real good job. They were very prepared. But, they weren’t very prepared to have a nametag produced for Angelo Esposito’s jersey, so they did a good job except for that one,” Shero said with a laugh. “We’re taking some chances on kids like every other team, but I think that’s what you need to do. We’re happy with the guys we got. The Penguins picked center Keven Veilleux from Victoriaville (QMJHL) in the second round (51st overall). The 6-4, 202 pound center is a native of Saint-Renee, Quebec, and tallied 55 poins (20+35) in 70 games last season. Veilleux speaks very little English, but certainly knows about the Penguins. “Crosby, Malkin – he knows our team and, obviously, he knows the top players,” he said via Penguins assistant coach Andre Savard. “He wants to improve his skating explosion. He will work at getting to the NHL, but he’s not setting any time limit. The Penguins had a pair of third-round choices and used them on defenseman Robert Bortuzzo (78th overall) and center Casey Pierro-Zabotel (80th). The 6-3, 196-pound Bortuzzo had 14 points and 67 penalty minutes in 63 games with Kitchener in the OHL last season, while the 6-1, 205-pound Pierro-Zabotel had 116 points (51+65) in 55 games with Merritt of the BCHL Tier 2 junior league. Pierro-Zabotel will attend Michigan Tech next season. 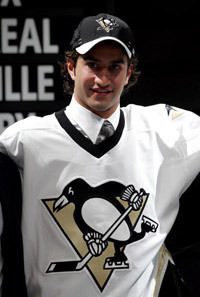 The Penguins had two fourth-round selections as well. They chose winger Luca Caputi with the 111th-overall choice and defenseman Alex Grant with the 118th-overall pick. Last season, the 6-2, 184-pound Caputi had 65 points (27+38) in 68 games with Mississauga of the OHL. Grant, a 6-2, 185-pounder, had 32 points (12+20) and 108 penalty minutes in 68 games with Saint John in the QMJHL. In the fifth round, the Penguins selected Jake Muzzin with the 141st pick. The 6-2, 206-pound defenseman had four points (1+3) in 37 games with Sault Ste. Marie in the OHL last year. 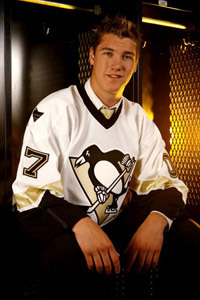 Pittsburgh added his teammate, Dustin Jeffrey, in the sixth round. The 6-1, 205-pound defenseman had 92 poins (34+58) in 68 games with the Greyhounds last season.